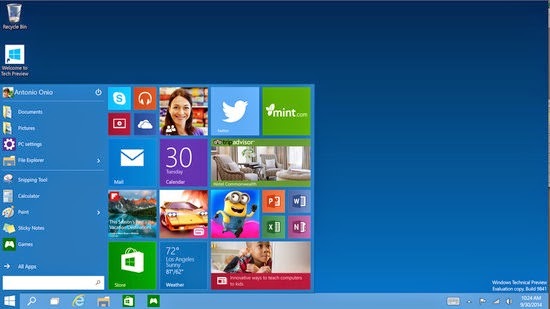 This week, Microsoft unveiled a long-awaited update to its operating system -- officially dubbed, Windows 10. Microsoft says that Windows 10 is an attempt to create a single operating system that works across phones, tablets and PCs, without the compromises that were visible in Windows 8. This is certainly a much needed update that should help them retain their core customer base, but it also doesn't do much to cover up their biggest weaknesses. First, let's point out the obvious. Microsoft's decision to skip a version number is curious. While Microsoft claims it was because Windows 10 was a "leap" forward, it is clearly an attempt to clear away the hostility faced by Windows 8, especially among enterprise users -- Microsoft's most important customers. While Windows 8 attempted to fuse two entirely different operating systems (and interaction models) together, Windows 10 seems to select the interaction model most suited to the available hardware. As a result, desktop users (and more importantly, enterprise customers) are no longer forced to deal with a touchscreen interface. It is these customers that Windows 10 is targeted at. This is certainly good news, but it only targets users at the very top of the computing pyramid. Of course, this top tier is defensible as long as the tablet's upmarket mobility remains limited. But lower tiers of computing remain a major challenge for Microsoft. At lower tiers of the computing pyramid (mainly characterized by consumption, not productivity), Microsoft still faces two major business model challenges. The first is that Microsoft's primary monetization model, software licensing, is no longer feasible. Android has become the de-facto standard for mainstream tablets/smartphones and is available for free. In response, Microsoft made Windows free for devices with screen sizes of 9 inches or below. This may seem like an arbitrary cut-off, but it highlights a clear delineation between Microsoft's core and non-core markets (as they see them today). Microsoft has been unsuccessful at monetizing consumer services, so the goal of this move may be more subtle. My guess is that Microsoft is attempting to subsidize Windows at lower tiers in the hope that it helps defend Windows at higher tiers. The thought is that a Windows phone or tablet user may be more inclined to remain within the Windows ecosystem. This brings us to the second challenge -- Windows doesn't really have a cohesive ecosystem. The app ecosystem Windows phones/tablets is sparse and that limits its appeal to a niche, price-sensitive segment and one that is unlikely to be valuable to Microsoft at higher computing tiers. The ecosystem for a Windows PC consists of very few applications or services that are valuable on a smaller Windows-specific device. As a result, the value of staying "within the Windows ecosystem" across computing tiers is very limited. As of today, these challenges don't pose an existential threat to Microsoft but that may not always be the case. To their credit, Microsoft seems to recognize this. Satya Nadella's emphasis on cross-platform productivity suggests as much.